Heroku CI automatically runs your app’s test suite with every push to your app’s GitHub repository, enabling you to easily review test results before merging or deploying changes to your codebase. Tests execute in a disposable environment that closely resembles your staging and production environments, which helps to ensure that results are accurate and obtained safely. Heroku CI works seamlessly with any Heroku Pipeline. If you don’t have one already, create a Heroku Pipeline for your app. Select a single verified Heroku user or team that will own the pipeline and all of its associated apps. Assign ownership to this user or team via the Heroku Dashboard. Heroku CI usage is billed to the account that owns the associated pipeline. Go to your pipeline’s Settings tab in the Heroku Dashboard and connect your app’s GitHub repository. Note that you must have admin access to the repo. Also from your pipeline’s Settings tab, click Enable Heroku CI. If Heroku CI doesn’t execute the correct command, or if some tests fail due to missing resources in your test environment, you can easily resolve these issues by configuring your test environment. You can configure your Heroku CI test environment by including an app.json manifest in your repository’s root directory. During CI test runs, any keys defined in this file’s test environment take precedence over any matching keys in your app’s base configuration. The scripts section of your app.json manifest lets you override the commands that Heroku CI runs to set up and then run your test suite. For typical usage of Heroku’s officially supported languages, you do not need to specify these (see additional language-specific documentation below). The scripts field can include two keys: test-setup and test. Each of these can be any shell command, including the path to an executable that exists within your application repo (e.g., make tests). The test script should be the command you use to execute your tests. It’s likely the same command you use in your local environment, such as bundle exec rspec or npm test. Heroku uses your project’s app.json manifest to determine which add-on services to provision for temporary deployments (i.e., deployments performed by Heroku CI and review apps). Many add-ons that support Heroku CI have a special plan that is provisioned for test runs. These plans are functionally similar to a production add-on plan but are quicker to provision and de-provision. For example, Heroku Postgres and Heroku Redis both have an ephemeral in-dyno plan that can only be provisioned during a test run. You can learn more about them in Heroku CI In-Dyno Databases. Some add-ons don’t support Heroku CI. If you attempt to provision one of these add-ons during a test run, you’ll encounter an error message like <add-on service slug> has opted out of supporting Review and CI apps. Note that unlike review apps, Heroku CI does not inherit any config vars from the parent app. Values specified here are available in all test runs. CI: A string indicating that this is a continuous integration environment. This value is always true. HEROKU_TEST_RUN_BRANCH: A string representing the branch of the commit being tested. HEROKU_TEST_RUN_COMMIT_VERSION: A string representing the commit version being tested (this is usually the commit’s SHA). HEROKU_TEST_RUN_ID: A string UUID representing the unique ID of the test run. After you enable Heroku CI for a pipeline, it runs tests automatically for every subsequent push to your GitHub repository. This means that all GitHub pull requests are automatically tested, along with any merges to master (which are typically deployed to staging). 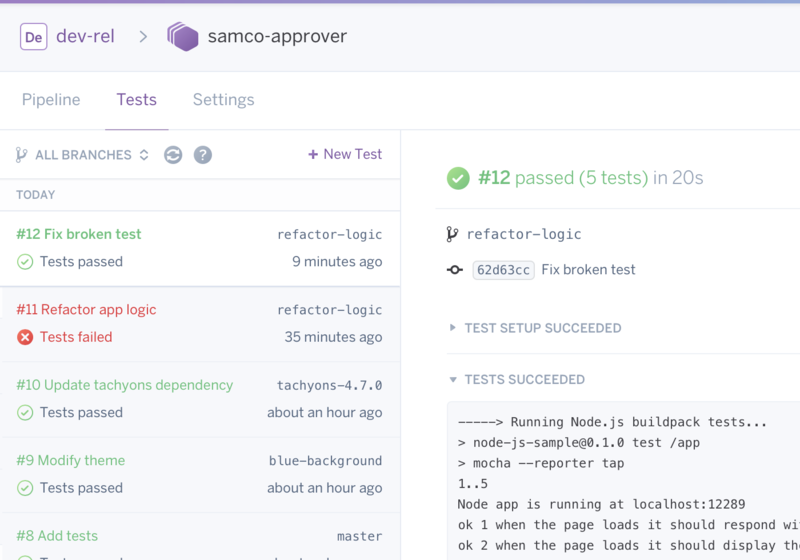 Test runs are executed inside an ephemeral Heroku app that is provisioned for each test run. The app is automatically destroyed when the run completes. CI does not run on Pipeline promotions, or on direct deploys to an app in your pipeline. Any arbitrary branch can be tested via a manual test run, available from your pipeline’s Tests tab. All Heroku CI test runs execute on the Common Runtime (even if the parent app runs in a Private Space). Consequently, test runs cannot access apps or resources running inside a Private Space. Heroku’s GitHub integration lets you automatically deploy a new version of your app (usually to development or staging) whenever a designated branch of your repo is updated. You can require that your Heroku CI test run pass before an update to this branch is automatically deployed. See Automatic Deploys to learn how. Heroku CI offers language support via the Testpack API, which allows a buildpack to prepare your app for testing, and in some cases, detect what tests to run. All of Heroku’s officially supported languages have full Heroku CI support. Some third-party buildpacks also provide support. To add Heroku CI support to a buildpack, the buildpack needs to implement the Testpack API. As an example, check out this pull request to the Elixir buildpack. For additional help or assistance, reach out to us at heroku-ci-feedback@heroku.com. Runs tests with go test ./…. For typical Node apps, this should mean you do not need to define test scripts in app.json (but you may in package.json). The Heroku Java buildpack supports Heroku CI. Compiles test source code into the target directory by executing Maven’s test-compile lifecycle. Executes tests by running mvn -B test or mvnw -B test depending if using your own Maven wrapper. Dependencies from require-dev in composer.json will be installed for test runs. You’ll need to tell Heroku CI how to run your tests with scripts.test, as they are not auto-detected. Make sure your test dependencies, e.g. phpunit/phpunit, are in your composer.json require-dev section, and that composer.lock is up to date. The sleep 5 call ensures that the PHP-FPM and the web server have started up fully before the tests are started. The Python buildpack does not automatically detect your tests. You’ll need to tell Heroku CI what tests to run with scripts.test in your app.json. supports both :ruby or :sql database schema when preparing database tests. In addition, will run rake db:migrate. Runs your tests with the appropriate Rake command (e.g. bundle exec rspec, bin/rails test, or rake test). For typical Ruby apps, you should not need to define scripts in app.json. The Ruby Buildpack creates a lib/tasks/heroku_clear_tasks.rake file in your application for a Rails CI test run. The Heroku Postgres add-on does not provide create, drop, or reset access. This file works around the lack of access since they aren’t needed to run your test suite. The Heroku Gradle buildpack supports Heroku CI. Runs tests with gradlew test. The Heroku Scala buildpack supports Heroku CI. Runs tests with sbt test. The Heroku Clojure buildpack supports Heroku CI. Prepares test environment by running lein deps (which will be overrided by the LEIN_BUILD_TASK config var). Runs tests with lein test. Compiles and installs dependencies with MIX_ENV=test. Runs tests with mix test. Note that because Elixir is not an officially supported language, you must still specify the buildpack in your app.json file. Also make sure that the test alias in your mix.exs file does not create a database, because adding the Heroku Postgres add-on does that for you. Release Phase is ignored during Heroku CI test runs. We suggest placing any scripts that need to run before your tests in your test-setup script. Parallel Test Runs for Heroku CI enable you to distribute your app’s test suite across multiple dynos to substantially reduce execution time. The (headless) Chrome buildpack enables tests that require Chrome (e.g., Selenium and other UAT technologies). Other solutions are also supported. 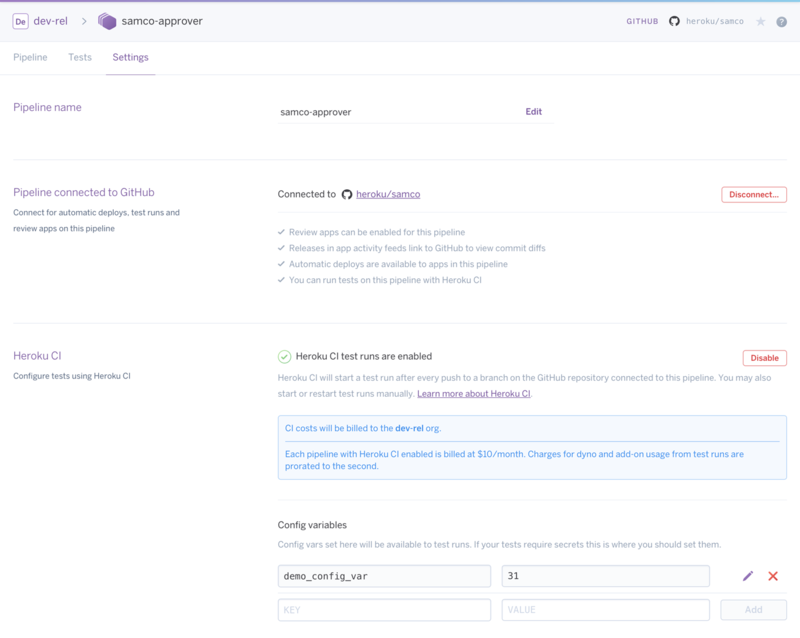 See documentation for Heroku CI user acceptance testing (UAT) for more detail. The Heroku CLI includes a ci:debug command that you can use to start a debug test run. This enables you to inspect the Heroku CI environment and the execution of tests inside a test dyno. This is handy for solving issues where tests pass locally but not on CI, or for debugging problems with test setup. You should run this command from within your repo. It will build a new test run and execute the test setup phase. Note that the heroku ci:debug command doesn’t require you to push your latest commits to GitHub. It creates a new test dyno based on your latest local commit. ▸    Skipping test setup phase. Maintainers of third-party buildpacks can add explicit support for Heroku CI to their buildpacks. Please contact Heroku for help adding this support to your buildpack. Consult Heroku CI: Technical Detail on Test Run Lifecycle for the sequence of events performed by Heroku CI during a test run. This information can be also be helpful to advanced developers who want to debug certain test run failures. Each CI-enabled pipeline is $10/month (prorated to the second). Additionally, dyno and add-on run time for the duration of the test run is charged (prorated to the second). This pricing enables you to try out Heroku CI with your pipeline for a very low cost. Cost details are available on the Heroku pricing page. When a test run is created, any add-ons listed in the app.json manifest’s test environment are provisioned with the “temporary deployments” plan specified by the add-on vendor. If the test environment is either absent or omits the addons key, the list of add-ons in the base manifest is used. Note that add-on providers are informed that these add-ons are being used to support ephemeral CI runs, and they might take measures to allow the add-on to provision and destroy faster, such as omitting long-term logging or regular backups. After a test run completes (reported as failed, errored, or succeeded), the test run’s add-ons are de-provisioned and destroyed. This means that any paid add-ons are billed at the plan’s rate, prorated to the second, only for the duration of the test run. Free add-on plans remain free on Heroku CI. On your pipeline’s Settings page in your Pipelines interface, under “Configure Heroku CI” you can select which party will be billed for CI runs. If your Pipeline is comprised only of resources owned by a Heroku Teams or Heroku Enterprise Organization (as we recommend), you will have only the option to bill that Team or Organization. If you have Personal apps in your Pipeline (which we do not recommend), you will be offered the option to bill CI runs to your personal account. Rails default fixtures load test data by first disabling referential integrity. If you are using this feature you cannot use the default Heroku Postgres add-on. Instead, you can use in dyno databases. The Xvfb Google Chrome Buildpack is incompatible with the heroku-16 and heroku-18 stacks. We suggest using the Google Chrome Buildpack (headless, without Xvfb) instead. Shorthand names for buildpacks is not currently supported. For example, heroku/jvm will not be automatically resolved to the fully qualified name of the buildpack https://github.com/heroku/heroku-buildpack-java. While we work on resolving this, please use the fully qualified name which can be found from the Elements page of each buildpack. To disable Heroku CI on a given pipeline, visit the pipeline’s Settings tab on the Heroku Dashboard and click Disable. Charges for CI-enablement and CI runs on the Pipeline will stop immediately. Note that CI is billed per second.